Using the borderscapes concept, this book offers an approach to border studies that expresses the multilevel complexity of borders, from the geopolitical to social practice and cultural production at and across the border. Accordingly, it encourages a productive understanding of the processual, de-territorialized and dispersed nature of borders and their ensuring regimes in the era of globalization and transnational flows as well as showcasing border research as an interdisciplinary field with its own academic standing. 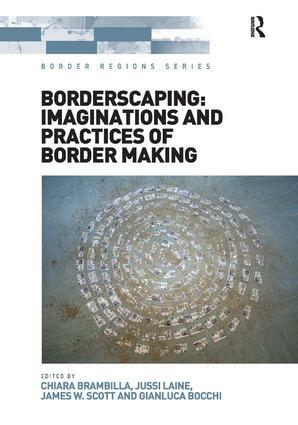 Contemporary bordering processes and practices are examined through the borderscapes lens to uncover important connections between borders as a ’challenge' to national (and EU) policies and borders as potential elements of political innovation through conceptual (re-)framings of social, political, economic and cultural spaces. The authors offer a nuanced and critical re-reading and understanding of the border not as an entity to be taken for granted, but as a place of investigation and as a resource in terms of the construction of novel (geo)political imaginations, social and spatial imaginaries and cultural images. In so doing, they suggest that rethinking borders means deconstructing the interweaving between political practices of inclusion-exclusion and the images created to support and communicate them on the cultural level by Western territorialist modernity. The result is a book that proposes a wandering through a constellation of bordering policies, discourses, practices and images to open new possibilities for thinking, mapping, acting and living borders under contemporary globalization. Contents: Introduction: thinking, mapping, acting and living borders under contemporary globalisation, Chiara Brambilla, Jussi Laine, James W. Scott and Gianluca Bocchi. Part I Conceptual Change in Thinking Borders: Spaces, lines, borders: imaginaries and images, Anna Krasteva; Beyond constructivism: Europeanisation and bordering under the impact of power and imaginaries, Hans-Joachim Burkner; Redesigning borderlands: using the Janus-face of borders as a resource, Henk van Houtum and Mark Eker; New geo-graphies of border(land)-scapes, Elena dell'Agnese. Part II Everyday Processes of Bordering: Remaking the border: post-Soviet borderscapes in the Finnish media, Jussi Laine and Miika Tervonen; From frontline to borderscape: the Hizbullah Memorial Museum in South Lebanon, Daniel Meier; On the metaphor of the 'Bulgarian question' in Croatian literary narrative: enquiring into the key bordering themes of post-1989 Balkans, Ivana Trkulja; The construction of socio-spatial identities alongside the Schengen border: bordering and border-crossing processes in the Croatian-Slovenian borderlands, Marta Zorko. Part III Exploring Shifting Euro/Mediterranean Borderscapes: Navigating the Euro/African border and migration nexus through the borderscapes lens: insights from the LampedusaInFestival, Chiara Brambilla; Euro-African invisibilisations in the border(land)scape of Punta Tarifa, Xavier Ferrer-Gallardo, Abel Albet-Mas and Keina Espineira; Humanitarianism and migration in the Mediterranean borderscape: the Italian-North African border between sea patrols and integration measures, Paolo Cuttitta; Between asylum and security: reconfigurations in the EU/Turkish borderscapes, Martin Lemberg-Pedersen; Cross-border cooperation as a territorial/relational approach to regional development?, Filippo Celata and Raffaella Coletti; Addressing Euro-Mediterranean border imaginations from a project-based perspective, Alice Buoli. Part IV Rebordering State Spaces: City Borders and Border Cities: Metamorphosis of city borders, Anna Lazzarini; Everyday bordering and raids every day: the invisible empire and metropolitan borderscapes, Georgie Wemyss; Living through the camp: Roma segregation and border-crossing in the city of Naples, Caterina Miele; Shifting borderscapes of London in Monica Ali's narrative, Maria Cristina Paganoni. Part V Cultural Production and the Emergence of New Borderscapes: Seeing and thinking borders, Holger Potzsch; Borders and transitive identities in Jamal Mahjoub's 'Last Thoughts on the Medusa', Jopi Nyman; Operationalising borders: Euro/African borderscapes on stage, Claudia Gualtieri; Contemporary art for mapping new borderscapes, Cristina Giudice. Index. Chiara Brambilla is Research Fellow in Anthropology and Geography at the Centre for Research on Complexity (CERCO), University of Bergamo, Italy. Jussi Laine, DSocSci, is a senior researcher at the Karelian Institute of the University of Eastern Finland and Executive Secretary and Treasurer of the Association for Borderlands Studies James Wesley Scott is Professor of Regional and Border Studies at the Karelian Institute at the University of Eastern Finland. Gianluca Bocchi is Director of the Centre for Research on Complexity (CERCO) and Full Professor of Philosophy of Sciences and Global Sciences at the University of Bergamo, Italy.